Vanessa basks in the sun from Memorial Day to Labor Day. A familiar silhouette appeared in Farm Pond in Oak Bluffs last weekend. With an arrival as reliable as that of backyard barbeques and beach days, Vanessa the green sea serpent resumed her post in the shallow pond off Beach road, where she basks in the sun from Memorial Day to Labor Day. It is Vanessa’s thirtieth year at Farm Pond. In the past three decades, she has had babies (the Gazette sponsored two naming contests), nearly drowned in Hurricane Bob, and posed for countless photos. And this summer, she has a book. “It’s time for her story to get out,” said Amelie Loyot, who is Vanessa’s primary caretaker and the niece of Vanessa’s creator Mindy Kendall. Mrs. Kendall “wanted to do something magical for the kids of the Island” back in the summer of 1984. From that impetus came Vanessa, who is “distantly related to Nessie in Loch Ness,” Mrs. Loyot said. She’s also distant cousins with Champ, from Lake Champlain in Vermont. The Vanessa of the pond is a floating wooden sculpture with glistening scales and, on occasion, a festive tail flying in the breeze. Every few years, a baby sea serpent floats behind her. One year, the baby was kidnapped and had to be rescued by Bob Duarte, the Oak Bluffs police chief at the time. But Vanessa is also a jumping-off point for the vivid imaginations of youngsters. 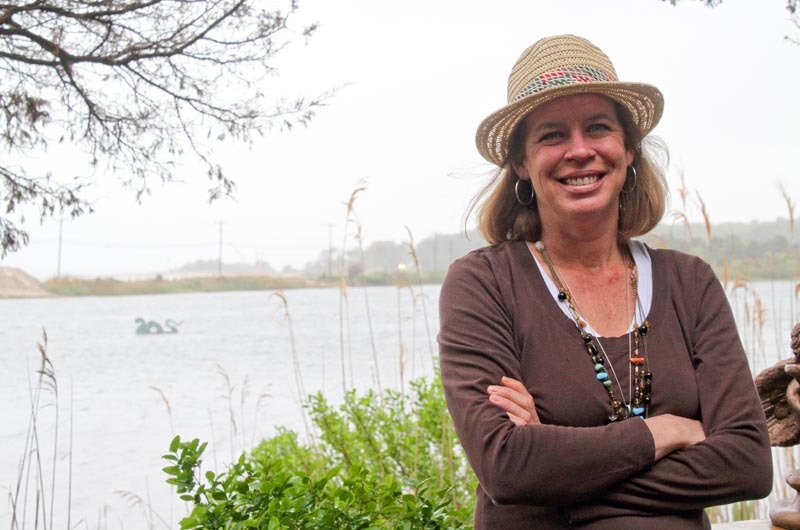 From Mrs. Loyot’s house off Farm Pond, she can hear exactly how Vanessa sparks creativity. “People on the bike path—I can hear them talking, and the kids [say] ‘Oh, mom, It’s a sea monster! I wonder what its name is!’” she said. 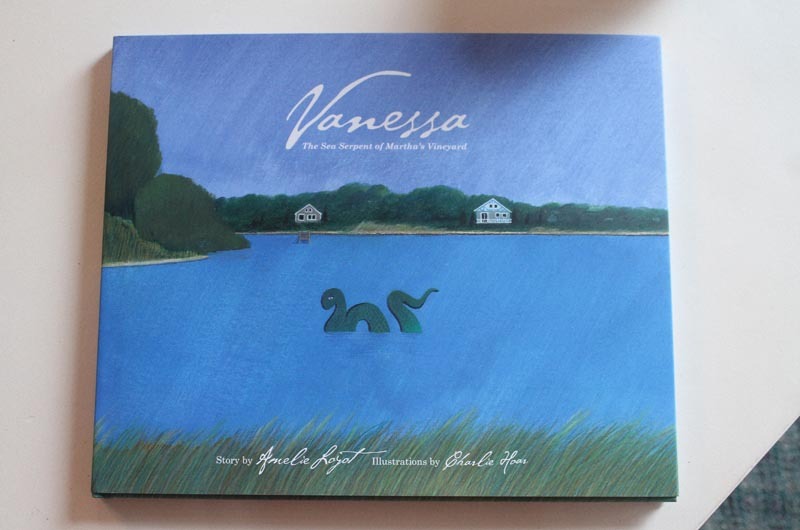 And so her book, Vanessa: The Sea Serpent of Martha’s Vineyard, bridges the two incarnations of the Farm Pond summer resident. Mrs. Loyot worked on the project for a year, crafting bouncy rhymes to tell the story of how Vanessa came to Farm Pond (mermaids are involved, of course). Her friend Charlie Hoar’s lush paintings illustrate the tale. The book will arrive on the shelves of Edgartown Books and Bunch of Grapes at the beginning of July. It will also be carried by the tour bus drivers who traverse the Island, Mrs. Loyot said. For more information about Vanessa, please visit mvseaserpent.com. 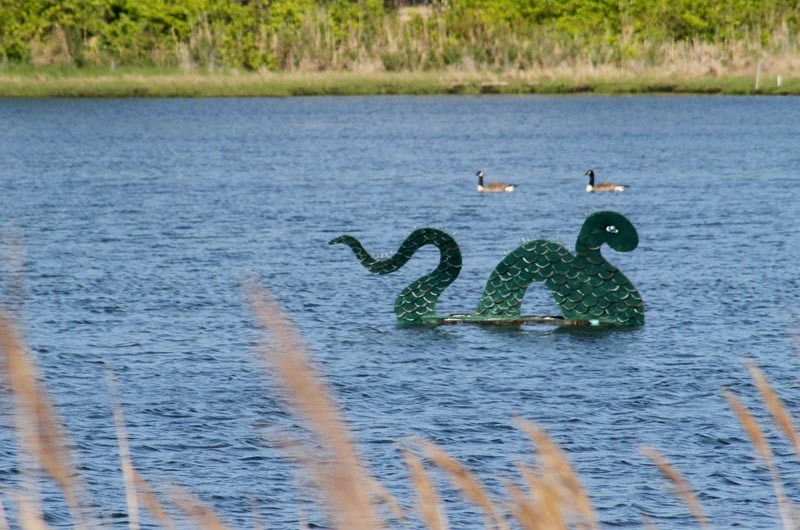 I love that sea serpent and thoroughly enjoy seeing her as I drive between Oak Bluffs and Edgartown. I can't wait to see the book! An absolutely wonderful book! I loved everything about it. The story is beautiful, the illustrations are beautiful. It's wonderful in every way!!! Ahhhhhh....Vanessa,we all have stories that we tell the little ones as we travel Beach Rd.What a welcome sight every yr.Can't wait to add her book to my collection. I really hope that the big pile of sand from the dredge will be moved before too long. It's such a pretty view, driving along the seawall. That pile of sand blocks the view of the serpent and the lovely pond. Congratulations on your book! I was thrilled to be asked to illustrate this book. Extremly well written and so very interesting. Amelie Loyot is amazing. Thank you so much Tony. It has been my absolute honor to take the reins from my Aunt in keeping her alive and well for Island children young and old. I hope I captured her magic in the book. It should be in stores in a few weeks. -Very Best. We always look for the vineyard loch ness and were happy to see her again this year. Summer can now begin. So happy that she's back! My girls have been hoping for a sighting the last few times we have been down and have been sad to find that Vanessa (now she has a name!) is "still sleeping deep under the water." They are young enough to believe she's real, and I love encouraging them in that belief in a bit of magic. Can't wait to get the book as well!